We are shooting a film in one of the greatest deserts of the world – the Gobi Desert of Mongolia. This vast desert covers much of the southern part of the country with extreme variations of temperature. The temperature here fluctuates between -40°C on the down side and over 40°C in the summer months. The extreme temperatures are just a quarter of the problem compared to the razor-sharp winds that flow intermittently blowing sands that give you the painful sensation of being cut with thousands of sharp blades on every exposed part of your body. The dust storms, the whirlwinds and the shifting sand dunes are an everyday phenomena. We Ladakhis lament living in the harshest climate in world. Let me tell you, Ladakh is in the tropics compared to the harsh living conditions that I experienced during my shootings here in the Gobi Desert. These are the wonders of nature for which you can’t do much. But what’s admirable is the people – the Mongolians, who are the inhabitants of this region. Within the extreme inhospitable conditions as I have described, the Mongolians have not only learned to adapt but also to live a vibrant life full of pride and high self-respect. They don't complain or feel miserable due to their environment but rather feel very proud, and this is reflected in every aspect of their life. 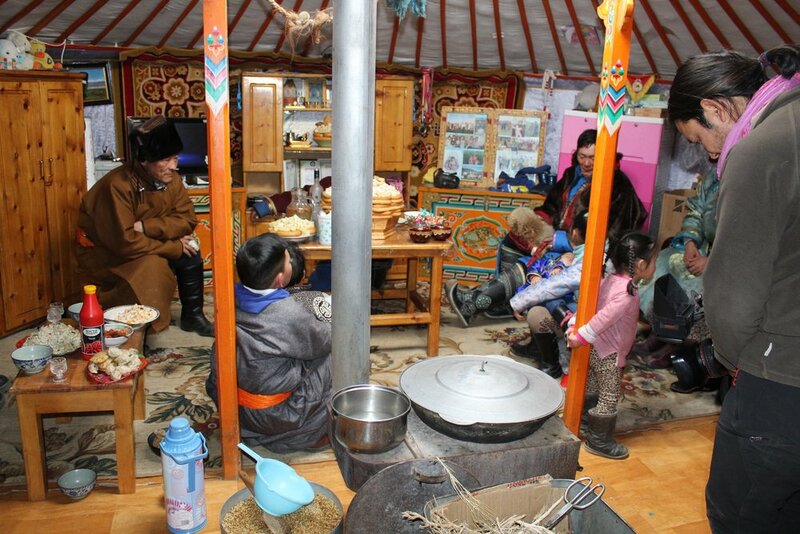 Every Gheer, which is a tent where native Mongolian families still live, is a cultural monument in itself. This ordinary-looking dome-shaped structure made out of felt is a wonderful piece of geometric art with elements of science. The outside temperature may be under -40°C but inside it is in the comfortable zones of 20°C with which even an ordinary Mongolian can live like a King with all the paraphernalia of a palace. The details of the artwork on the wooden support structure of the Gheer tent are comparable to the elaborate paintings in the monasteries back in Ladakh. The other artifacts that you see inside almost all the Gheer are masterpieces that are not just beautiful decorative objects, but also practical objects that the Mongolian family uses on a daily basis. The extreme temperature and the harshest living conditions also have their counterparts in the form of extreme hospitality and the gentlest nature of the Mongolians. One can say that every Mongolian is a born hunter, but on the other side one can never fail to see how compassionate they are by heart – maybe Buddhism has a hand in this factor. Hunting is a way of life in a place where agriculture is not possible. We must all learn from the hospitable, gentle and friendly nature of the Mongolians. Yesterday I was honored to screen our film, "The Shepherdess of the Glacier" at Eliezer Joldan Memorial college, Leh. This was a great experience for me. After having had many screenings in India and even around the world, this screening was something very special to me. I feel very honored to be able to show this film to some of the youth of Ladakh. They all showed me great enthusiasm and the interaction with them after the film was very rewarding for me. And still, they further honored me with a certificate of appreciation and a trophy for the same. For this wonderful day, I would like to thank Prof. Deskyong Namgial, Principal, EJMC. the whole faculty and all the students. I was happy to be part of the 15th Eco Pad Yatra, led by His Eminence Drukpa Thuksey Rinpoche. This Pad Yatras was a walking pilgrimage of over 290km in the Nubra Valley, with the purpose of connecting people with people, nature, and their own selves as well as to spread awareness of environmental issues such as pollution and water shortage. It was an amazing experience! In July 2018, I spoke with students in a media class at the Siddhartha School in Stok, Ladakh, about ... many things, including the art of filmmaking to tell your story. I said it is important to develop a bright head and a skillful hand, but without the third important element - a kind heart - you will not produce good work. So develop those three important skill-sets! I think filmmaking is one of the most important tools if you want to bring any change to society. Don’t have any inhibitions about this field. Films can change lives and society. Life as a filmmaker is a little challenging but it is a very satisfying life. We will all die one day but our films will be there for thousand years. So keep making good movies! This video was produced by Woodland Shoes. How did it happen? Last year when I was attending the IMF (Indian Mountaineering Foundation) award with our documentary film "Shepherdess of the Glaciers", the team of Woodland shoes was also there. That is when I met them. Then, last month, I was informed that I got selected as the face of Woodland shoes. It was surprising. I was called to Delhi for the shoot. And now a lot more people know about me in India! To tell my stories, I must often film in extreme conditions such as -32 degrees Celsius, steep terrain, and heavy snowfall, all the while carrying a 30-kg load of film equipment! For The Shepherdess of the Glaciers, I trekked many kilometers in harsh conditions to accompany my sister and I also had to trek back to the village every seven days to recharge my batteries so I could continue to shoot. It was difficult, but I was reminded every day of my upbringing as a shepherd until the age of 13. Other times, I have had to climb high up rugged mountains or bare the intense light of high altitude desserts. Of course I don't mind. I feel closer to nature and to the true human spirit. My goal as a filmmaker and in life is to contribute to the positive development of Ladakh, Jammu & Kasmir and my Country. And to help others create their own cinematic visions here in this beautiful and unique part of the world that I am proud to call my home. Why I Made "The Shepherdess of the Glaciers"
I was raised in a family of farmers and herdsmen. I looked after the goats with my sister until I was fourteen, when I left my village to go to school. After our father died, it was up to my sister, Tsering, to take charge of the herd. She was twenty-seven at the time. I can’t help wondering about the choices life has prompted us to make, about the way life shapes our very being. Tsering lives alone in the vastness of the Himalayas. Her only companions are her goats and the wild animals that prowl nearby. The sole link between my world and hers is a transistor radio tuned to All India Radio. I gave her that radio. For eleven months of the year Tsering lives at an altitude of 4,500 to 6,000 meters, in temperatures ranging from 35°C below zero, to 35°C. She is several days walk from the village. Up in the mountain, higher and higher, she walks all day long, in all weather, seeking meager pastures to feed the herd. How can she possibly survive up there? Where does she find the strength? In fact, Tsering shepherd’s life – her own life as well as the life of the herd. Anticipating, nursing, protecting, delivering kids, worrying and, in the end, accepting. She and her herd engage in a daily struggle for life. Last winter the herd lost seventy goats. The snows lasted too long, the kids died, famine threatened, the leopard struck. Tsering dealt with all these hardships. She’s not afraid of anything. When the possibility of marriage arose, Tsering chose to look after the herd. Denied all human company, my sister learned everything by contemplating the mountains, the elements, plants and animals. Tsering is attentive to everything, to everyone. She knows every crevasse on the glacier, all the plants that heal, the sky, the moon, the leopard. She knows every one of her goats. All her senses go to work. My sister is a doctor, herbalist, weather forecaster, veterinarian, botanist, Himalayan guide, economist, philosopher, and goatherd – she’s all of them rolled into one. Every day Tsering has to cope with limits – her own physical limits, environmental limits. She knows the world is competitive, but that her only real adversary is herself. Tsering is strong.